The most common questions I field in person and online are about dance shoes – this is our one essential piece of “equipment” or “gear” (since street shoes are only occasionally made in a way that they can be an option), so it stands to reason that shoes would be the primary topic of discussion about what we put on our bodies when we dance. I’ve written about swing shoes before for Atomic Ballroom, but that was over 3 years ago, so it’s probably time for an update. Instead of doing another overview, I’m going to write about my favorite dance shoes of the moment – my go-to shoes for a variety of situations and ones that I would recommend to others. I’m also going to photograph them so you can see how much they are loved. This is my main shoe right now – gold goes with almost everything and these are so nice and broken in that I just can’t pass them over. They are my most flexible pair and, with a low heel, are ideal to transition back and forth from Balboa to Lindy Hop/Charleston. The addition of a gel pad at the ball of my foot has combated any discomfort for lack of shoe padding. They are starting to look pretty bad because of so many people stepping on the toes, but a gold Sharpie is helping to keep up appearances. I bought these shoes years ago at Lindy Focus from Nina’s mom, Laurie Gilkenson, who was cleaning out some of Nina’s vast vintage shoe collection. I was told that they were the model for Dancestore.com’s mesh oxford, which explains also why I love that shoe so much, as well (but the original is still my fave). The leather on these shoes is so broken in, the sole is the perfect consistency, and the mesh keeps things cool and flexible. They are very worn and the polish has come off the heel and I don’t care. This is another wonderful 2 inch heel that’s great for a dance where you have to do everything – it’s a bit thicker than the Re-mix Balboa heel, so if I’m stepping into uncharted dance territory, I’ll opt for the thicker heel. 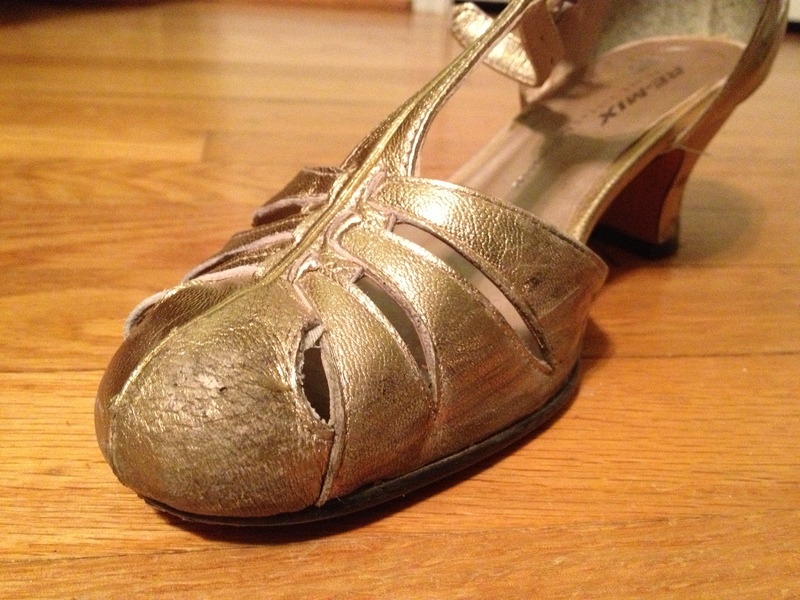 This is also me advocating for wearing vintage shoes for dancing – they don’t have to be in pristine cosmetic condition. If the shoe is still solid structurally and fits, wear it! 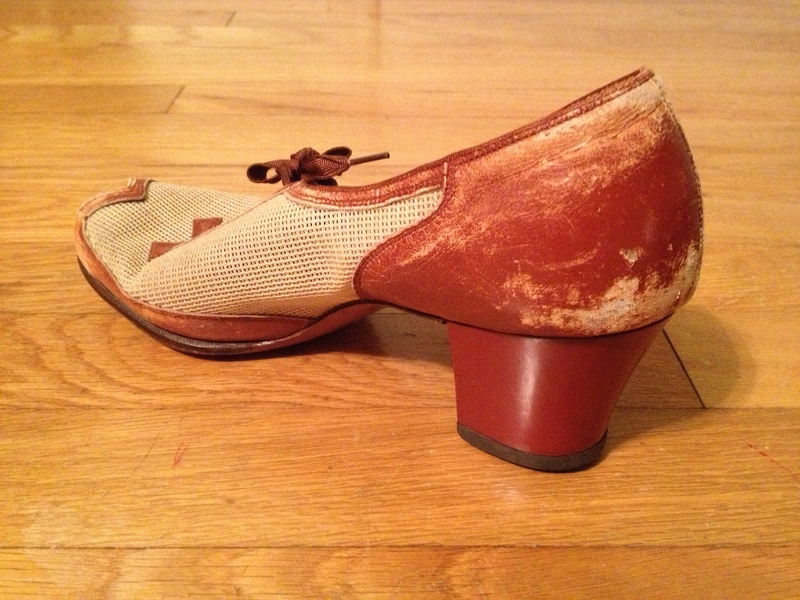 I am sad that these are no longer in production (except in brown), but this is my lazy comfort shoe – I am so used to wearing heels when I dance that the wedge is as low as I usually like to go, but I do appreciate the groundedness of full contact with the floor. Stability is key here. If I wore these for long, they would rub and leave blisters on my heels, so I added some Pedag leather heel grips, which solved the problem. When I am working on solo jazz movement or routines, I want to start out not worrying about my personal balance or lines or anything other than focusing on basic movement and learning. I do have personal balance issues and, when I don’t have another person to help with that, I tend to want to be in flats. I also have my limits with heels and anything longer than a regular dance weekend just makes my feet want to give up. 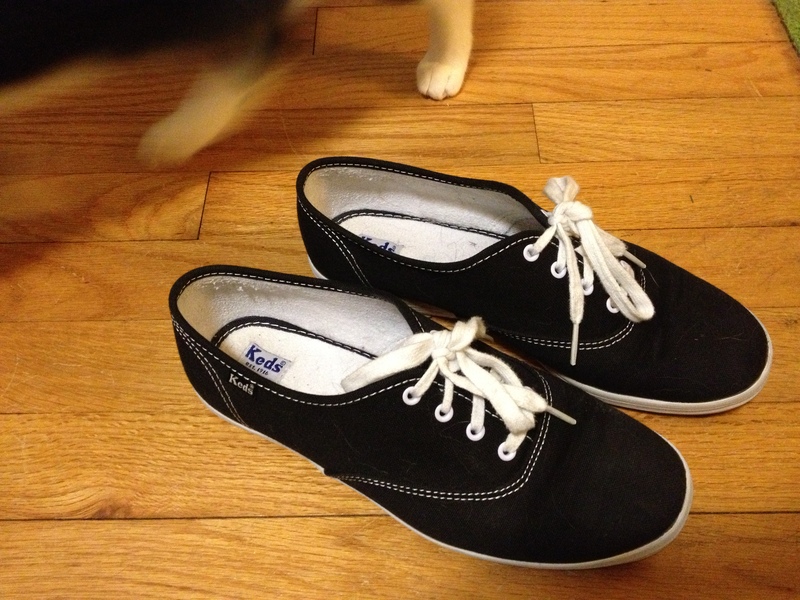 I would probably wear Keds more often, but my heels slip out of them and I have to wear thick socks with them to keep them on, so vanity and convenience can sometimes override my dance shoe selection. Another pair of dance shoes priced to move! Aris Allen Red Velvet Oxfords, size 7.5, starting bid $5.99. The shipping is a little steep at $18.35 *ahem* for Expedited mail, but perhaps you could convince the seller to ship at a lower/slower rate. I just sent Lindy Dandy a box of goodies to Kabul and it didn’t cost half that…anyway, bid away and don’t forget to message the seller about the shipping and perhaps some more details about the condition of the shoes. Aris Allen wingtip oxfords (in white and two-tone black/white) are $69.95 (marked down from $84.95). Men’s wide leg trousers in brown for $14.95 (marked down from $39.95). Brown and tweed/plaid saddle shoe for $34.95 (marked down from $49.95) – I have these and they are adorable and comfortable. 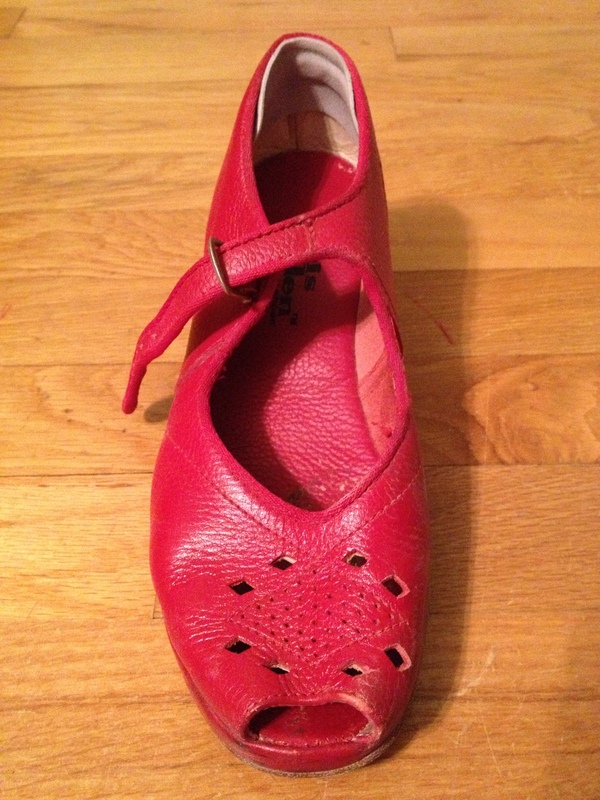 Red wedges, size 6, starting bid $10 – the listing says “used only once as I have no sense of rhythm” – my heart goes out to her! You get the idea – and there are more! So many of their shoes are $10-$20 off, seems like a good time to stock up on some staples. All you need to know is in the title – looking for an inexpensive pair of dance shoes? This is it! Grab these white Aris Allen wingtips, worn once, at this great price! Because men’s dance shoes so rarely appear on eBay, I’m passing along this gently used pair of men’s brown and white Aris Allen wingtips, size 12. Starting bid is $25, but you could buy them now for $32 (plus a very reasonable $4.50 shipping).